The landscape of billing and pricing models has been changing. We were comfortable with one-time transaction models, and now, everywhere you look there is a subscription, or a recurring payment on a schedule. Now, it’s common to pay a recurring fee for movies, music, free shipping, etc. If you at your credit card receipt, you’re likely to see at least a few. In the SaaS industry, subscription businesses have made the buy-vs-build decision easier. Instead of taking resources and focus away from your company’s core competency, to build and maintain an in-house product, you can justify a subscription for the same product. This makes a company more efficient, allowing it to focus on its own product. This is also advantageous for budget-conscious startups who need to leverage other products to reach product/market fit quickly. The shift also hit B2C companies as well. Whether it’s cell phones, subscription boxes, or even software like Microsoft Office, subscriptions allow you to make purchases without saving up for a product – making budgeting for products easier than ever. For companies with some sort of recurring model, simple recurring billing isn’t enough. As pricing models shifted to recurring models, technology has also evolved to make it easier for companies to manage their customers. Recurring billing is rather simple compared to subscription billing management. At its simplest form, your customers’ cards are charged at the same time at an ongoing interval, like each month, every 3rd Tuesday, every week, etc. Think of recurring billing as your email account while subscription management is your CRM. If you have an email account, you can technically manage your contacts, and can send emails. To get more functionality, however, like managing customer records, creating triggers, autoresponders, automated emails, etc, you need a real CRM. You can build this yourself, but it takes a lot of time and cost upfront as well as ongoing to maintain. The same with recurring billing. If you want more functionality, you’ll have to start creating that yourself. One of the main problems with simple recurring billing is the lack of flexibility. When you first start billing customers, a simple $10/mo plan might be all you need. But what if your company decides to charge per seat? What if you want to offer free trial periods to your customers? Your recurring billing setup doesn’t understand that. All it understands is “charge customer X $10”. Suddenly, what seemed like a small change to your pricing model means a lot of work for developers. There’s many other issues that can occur if you don’t have subscription billing software that’s designed to manage these problems. Everything from declined credit cards to prorating, a subscription billing system is designed to help you manage all the complexities that come with recurring billing. The core piece of subscription billing is obviously recurring billing. This is what enables you to keep a card on file and automatically run transactions each billing cycle. If you only have a simple recurring billing model setup, you’re leaving a lot of money on the table. Everything would also be fragmented. You’d have to be using multiple different pieces of software to keep track of you customers, bill your customers, email your customers, etc. Dunning allows you to capture potentially lost revenue due to failed payments. If a customer gets paid on Friday, but you charge them Thursday, and they don’t have enough funds in their account, the transaction will fail. Being able to easily configure your system to try again means you can help to prevent customer churn. Communication emails are a great compliment to dunning to let your customers know when they’ve made a payment or if the transaction has failed. 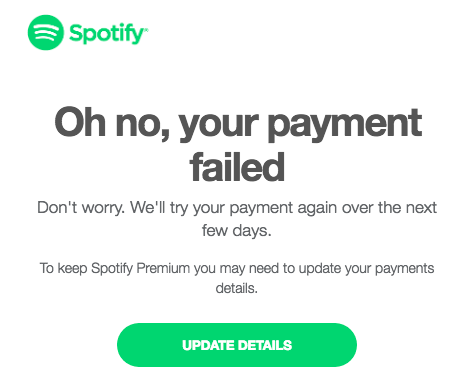 For example, when you fail your Spotify payment, you get an email saying your payment declined and they’re going to keep trying (see image below). If you’ve changed cards, they even have a button to update your billing info. Recurring billing systems are much simpler than subscription billing and cannot manage dunning. Doing that with recurring billing? Not as easy. Promotions are a great way to help make your product more appealing to customers. With a subscription billing system, you are able to easily provide and manage promotions. Creating pricing plans for different billing models is significantly easier with a subscription billing system. Instead of having to code a pricing plan, you can manage all of your pricing plans from an easy-to-use dashboard. 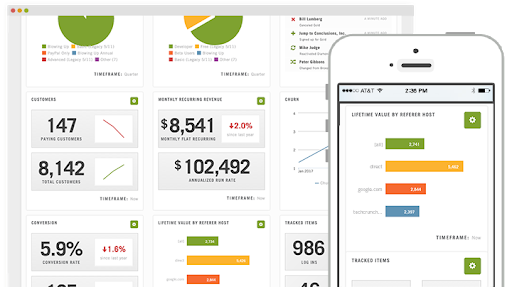 Having a reporting dashboard helps to give you a snapshot of your business. Keeping track of important SaaS metrics like monthly recurring revenue, churn rate, and customer lifetime value is essential to making sure your company is staying healthy. When customers upgrades plans, it doesn’t make sense for them to pay for a full month of a more expensive plan if they were only on the plan for 2 weeks. Similarly, If they were on a more expensive plan you want to be sure that your customers were actually charged for being on the plan. With prorating, you can choose how you want to charge customers who upgrade or downgrade mid billing cycle. With subscription billing, you can customize your system to work the way you want it to. You also keep everything in one place. One piece of software handles all of your billing needs for you instead of trying to hack multiple systems to work together. Anybody that needs some sort of recurring billing can take advantage of subscription billing. For the price, it really makes sense to be using a complete system. Unless your company only has a few users and you don’t intend on scaling it ever, then starting out with a subscription billing platform helps you save time and is going to make a lot more sense in the long run. Billing for subscriptions has opened up entire in industries and niches for any product. Everything from subscription boxes to SaaS, would be much more difficult without subscription billing. Being able to charge a card at the same time each month allows companies to focus less on renewals and more on growth. At scale, revenue and growth are quite predictable. By looking at customer acquisition cost, lifetime value, and churn rate, it becomes simple to calculate how fast your company can and will grow. If your product is SaaS, the margins are much higher than most other industries. Other than ongoing development costs, the main cost that SaaS companies face is the cost to market and sell their product. The cost of building any SaaS product in-house is is high. Depending on the complexity of the product, and how much your developers are being paid, costs can get out of hand quickly. Even worse, the timeline to build and integrate with an in-house system can be months. Buying software can also be a very expensive up-front cost. For example, the cost of buying a “perpetual license” for Microsoft Office ranges somewhere between $150 and $500 depending on which products you need. The cost of a monthly subscription, however, is only $7 to $10 for the same products. Most SaaS companies don’t offer an option to purchase a “perpetual license” as Microsoft does. The benefit to the consumer, however, is the same. By purchasing a subscription to a piece of software, consumers have significantly lower initial costs. Costs for subscriptions are also much more predictable than their non-subscription counterparts. Whether you’re buying a subscription box, a computer, or software, budgeting for subscriptions is easy. Instead of saving up for one big purchase, you simply make small monthly payments that add up over time. Because it’s so easy to switch from one subscription to a competitor, companies are always trying to create new features, and provide a better customer experience. This is a great benefit for customers, as products will continually improve. If customers are unhappy with product improvements, or their experience, they are able to switch with significantly lower costs than if they had to buy an entirely new product. 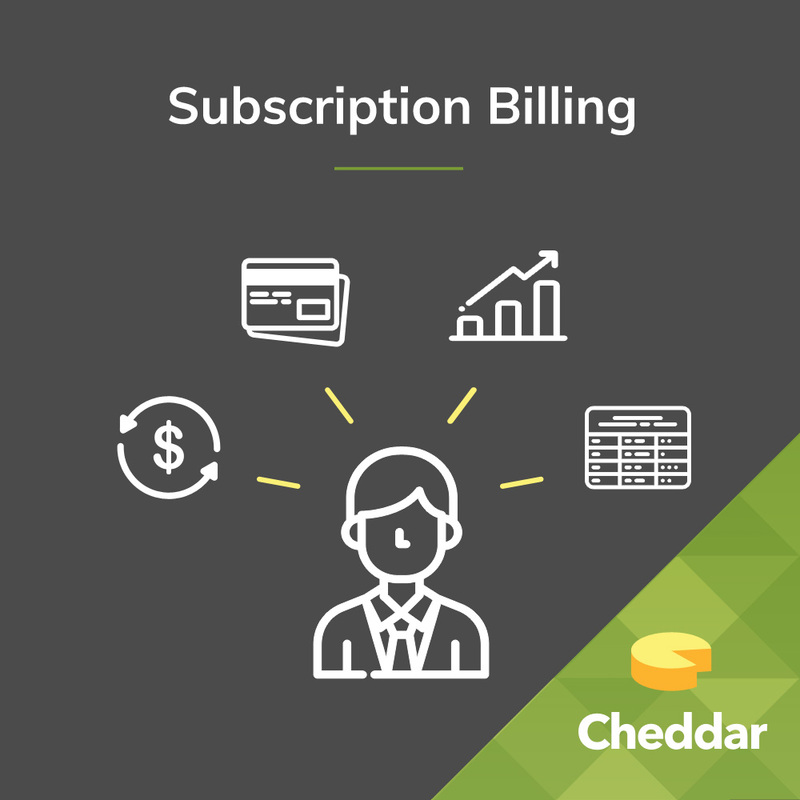 With Cheddar, you only need a subscription to one piece of software to manage all your billing needs. If you’re in the USA, Cheddar has your payment payment processing, payment gateway, and your entire subscription billing solution bundled together. At its simplest form, all you have to do is create a customer and subscribe them to a plan. This means you can start billing your customers in as little as one day! Setting up flat subscription bills is easy in Cheddar. As your company grows, and you want to change your pricing or perhaps try out a different pricing model, it’s going to be really easy to do that within Cheddar. Cheddar has its own built in payment processor, but also supports numerous third party payment processors, which means that you can swap out processors at any time. Cheddar allows you to track real-time customer activity – without having to bill for it. Our simple counters that we call Tracked Items, allow you to track the way in which your customers interact with your system. If you eventually want to use some sort of usage-based pricing model, all you have to do is select a tracked item and apply billing logic to it. Our support team is awesome. We have a wide range of ways to get in touch, which allow you to get the answers to your questions the way you want.